Disposable Adult Bibs Protects Clothes Against Spills. Effective, cheap and easy to use – these handy disposable adult bibs are a simple solution to a common issue. Provided in packs of 50, the bibs tie comfortably behind the neck and have a 4” trough to prevent run off. Ideal for a number of activities and situations, including meal times, craft activities and travelling. 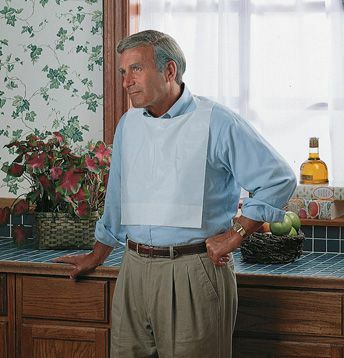 The bib are a large enough to cover all sizes successfully, and keep clothes spill and stain free.